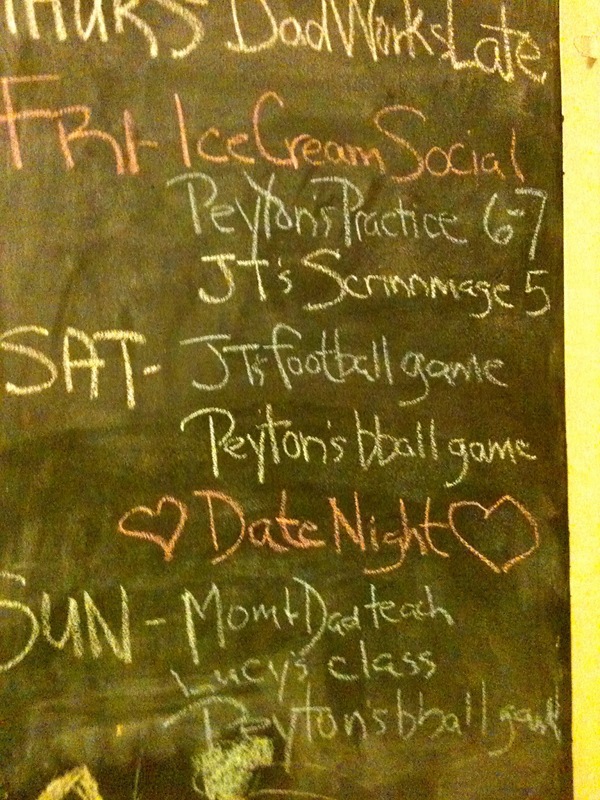 My husband planned a date night. He texted me that he got a sitter and we were going to tear up the town on Saturday night (which meant using a recently found gift card to Chili's and going to a movie). Date night even made the chalkboard schedule. Normally, I must confess, I would not be very sympathetic. I would be annoyed and bitter. I won't pretend that I'm better than that behavior. I wish I was, but usually I am not. Usually, but I'm happy to say this past weekend was different. It may not look pretty but this is how I end up watching my kid's game (sick husband or not). Instead of resenting the fact that he was sick or that our date night was cancelled or that I know I will come down with the killer cold in the middle of the week when he has to work late--I let it go. As corny as it sounds, I embraced the whole caretaker role. Okay, that might be going a bit far. But I did let go of any bitterness or expectations and enjoyed my kids. Lucy was not very interested in her brother's football game going on BEHIND her. Maybe it's because the first couple weeks of school have gone well. Maybe it's because having a routine feels good. Maybe my kids are just plain adorable, albeit rough and kind of wild, but still cute. Or maybe it's the fact that I feel lucky/blessed. My husband will get better and we'll have another date night (Chili's here we come! ); I spent a weekend pretty much alone with my kids and I really like them, not just love them with all my heart, I like them. Yes, I am lucky/blessed in deed. The amazing Jill Scott singing Blessed live. Love it. Blessed by Martina McBride: I remember listening to this song years ago and wanting to have this life. And now, I do. Amazing.